Jewish Humor Central: A Joke to Start the Week - "Fundraising for Israel"
A Joke to Start the Week - "Fundraising for Israel"
It's Monday again, and time for one more joke to start the week before we start posting this year's crop of Chanukah videos. Today's joke is told by Len Portnoy, a member of the original Old Jews Telling Jokes crew. 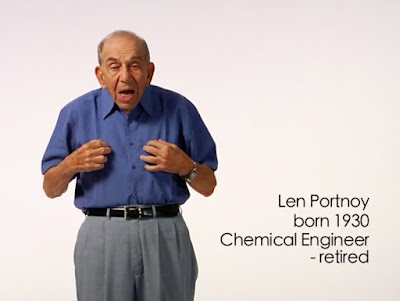 Len is a retired chemical engineer. Here's the setup: At JFK Airport, there's a long line waiting to go through security. A little Jewish man holding two shopping bags walks right past the line.